Salmo Part of the BC Adventure Network. Over a million web site visitors annually ! Salmo started as Salmon Siding, on the Nelson & Fort Sheppard Railway. 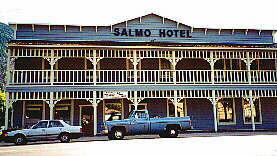 Salmo is Latin for salmon and the Salmo River was called the "Salmon River" until the 1850's. At one time spawning salmon were plentiful in the river on their way to the Columbia River. The streets and 1930's architecture of downtown are being revitalized. Particularly of note are murals by students of Salmo's School of Stone Masonry. These murals are made of locally quarried stone and mortared onto the downtown buildings. Access:Salmo is located 43 km east of Castlegar at the junction of Highway 3 and 6. Both these highways are well maintained, paved routes. There is also an airstrip for the small plane enthusiast. The Skyway or Mile High Pass east of Salmo is occasional closed in winter due to avalanches. 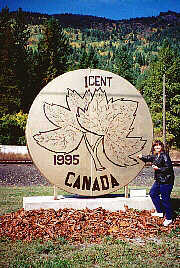 An alternate route is the free ferry across Kootenay Lake to Creston. Accommodations: There are motels with full amenities within town limits. For the RVers and campers there are two RV parks and camping facilities. In the surrounding area are resorts and bed and breakfast accommodations.